that rachael ray's dunkin donuts ad was pulled out after comments about her silk scarf as supportive of the terrorist cause is disturbing in the least to a lot of filipinos who have inserted the traditional arab garb known as keffiyeh into their gimik attires. palestine's yasser arafat is probably the most photographed arab man wearing the headdress, but western fashion has a life of its own, and lately, filipinos have joined the trend. and at an alarmingly high rate, it hurts my eyes. i used to just see these on mountaineers and activists, although according to wikipedia, it's been wildly popular in the US much earlier. in fact, locally, i'd mostly associate it with abner mercado, who has probably worn it so often, it looks like it's part of his skin. in a way, i agree with some of the criticisms of rachael ray's ad: that celebrities have mainstreamed the scarf without understanding its traditional use or origin, but i disagree with the myopic view that the scarf is closely associated to murderous jihad and muslim terrorists (words from conservative columnist michelle malkin, google it). 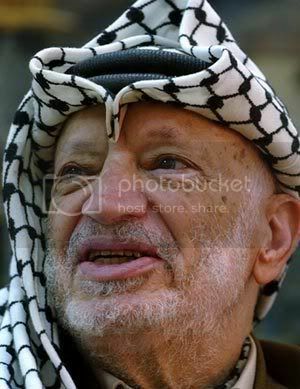 these days, i see the keffiyeh/kaffiyeh everywhere. i've spotted it on richard gutierrez, on a cover of a music magazine, on a music video, and everywhere i look, young people are wearing it, without really understanding where it's coming from. i have no problem with traditional costumes finding their ways into mainstream fashion, but a lot of people are so ignorant. i've worn this scarf before, and i've been described as a terrorist myself, and just because i'm so ahead of local trends. so i wonder what local fashion is going to co-opt from either indigenous or traditional costumes in the future. will the bahag make it up there as haute couture as well? News photographers use the red and white checks more closely associated with another tribe of mass murderers -- the Khmer Rouge of Cambodia. Not cool either way, but even less so now that it has reached the mainstream i.e. movie stars :) You are right, why are they wearing loincloths up there? i don't think there's anything wrong with wearing a scarf, even one identified with terrorists or a marginalized group (i've been looking for a traditional thai fisherman's scarf for the longest time), but people wear these things without understanding their origin or original use, just because they saw it on a big star who is equally ignorant. haha. 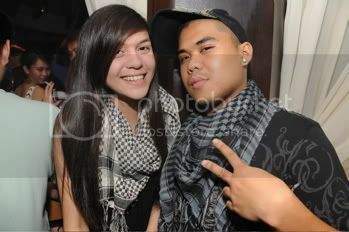 gusto ko ng khmer rouge scarf! where to get one! when you going to china? me want pasalubong. haha. (Miriam to Chiz: Do you not read ...?) ha ha. Somebody actually gave me one! It's yours if I find it. can i wear it at pho bac instead? i doubt anyone's vietnamese there. haha. it'll only be seen in the mountains. i'm not into the scene anyway. thanks, and i hope you find it. and go go go miriam! I found it, will give it to you next week. But what do you mean "into the scene," you alcoholic ha ha. The Taliban (now there's another group of mass murderers, care to use a burqa?) banned football and converted the Afghan national stadium into a prison. They used the crossbars (in football, the metal bar on top of the two goalposts) to hang women who did not wear the national dress. really? great. can't wait to wear it during my next gimik. i'm so gonna start a fashion craze, haha!